Even in South Florida we begin to see lush colors emerging as we enjoy our subtle seasonal changes. At my home, butterflies are taking flight and the wildflowers are just doing what they do – being abundantly wild! Spring is the season of dramatic change and creates a renewed sense of awareness and appreciation of our surroundings. April typically is recognized as the “green month,” with Earth Day celebrations and other focused events. We certainly welcome your comments and household/business suggestions to make our community more sustainable. One project which has been a priority for the City of South Miami for the past couple of years is to make South Miami a more pedestrian and bicycle friendly community. Those who know that I am a commuter cyclist also know that this is a passion of mine as well. People first, then cars! And to that there are two major developments in the county which are in the forefront of community discussion. One is the “Ludlam Trail” which is a seven-mile corridor of the FEC right-of-way going from Snapper Creek to essentially the Miami International Airport. It was originally hoped it would be a “Rails to Trails” initiative as seen and enjoyed in other parts of the country. However after years of being fallow and no major stakeholders purchasing the land from FEC, there is now a plan to develop the corridor for additional housing stock for the county. Numerous meetings were held over past several months to mitigate this possibility. Hopefully a good compromise can be reached to ensure the viability of a recreational trail for generations to come. The second major project is the subject of our cover feature: “The Underline,” a ten-mile linear park and trail under the Metrorail. It’s an exciting possibility and SOMI Magazine is fully committed to promoting The Underline, and provide updates to our readers in the coming issues. Both projects, the Ludlam Trail and The Underline are important in building connectivity throughout the area, and very worthy of public and private support to provide an enhancement to the quality of life in our community. SOMIartwalk© finished up its 2014/15 season last month. I’d like to acknowledge the businesses which have participated in the event since October by hosting artists in their establishments; our ArtNight Ambassadors, members of the South Miami Senior HS JROTC, who assist visitors to the community; and the visual and performing artists who have shared their talent with us. Planning for next year is already underway. Visual and performing artists and those who would like to volunteer to make SOMIartwalk© a more memorable experience, please contact us through www.artnightsouthmiami.com. Over the past couple of months, we’ve also seen some other changes in town, with new restaurant openings and new businesses establishing themselves in our community. It’s a great sign that SOMI is always seen as a destination shopping/dining district. 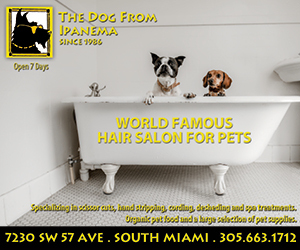 And the best way you can help our locally owned businesses is to patronize them. In our next issue we’ll be running our Readers’ Survey. 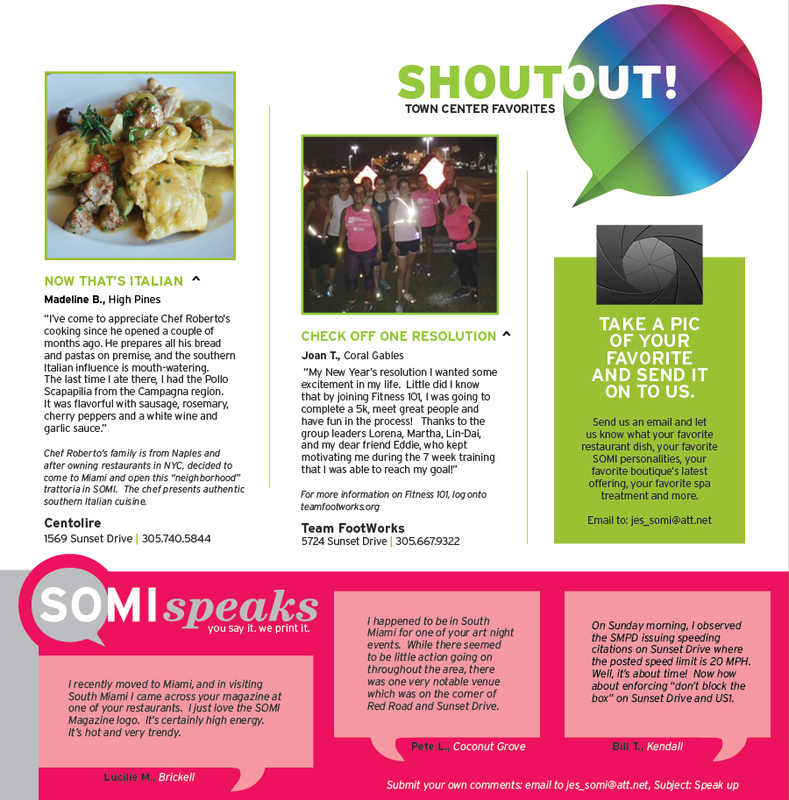 However, you can let us know what you think about SOMI Magazine anytime you want. And I welcome you to do that, thanks. Hi I read and love SOMI magazine and SOMI guide. I always pick it up when I see it lying around in the shops or cafe’s in the area. I’m a International Board Certified Lactation Consultant with my office in San Amaro Ave Suite #1. Board Certified Lactation Consultants (IBLCE) are valued as the most trusted worldwide source for certifying practitioners in lactation and breastfeeding care. I get referrals from different pediatricians in the area. I do home and in-office visits. Im a very important resource to have for our community and would be honor that you include me in your directory.